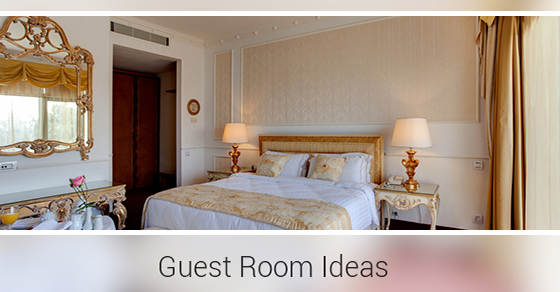 Your friends are coming to stay with you and you’ve offered your guest room so they don’t have to stay in a hotel. While that does gain you a certain amount of bonus points as a great friend, your sparse spare room with its cot and dusty bedside table will likely not cut it. Here are five ideas to turn your guest room into the perfect place for out-of-towners to rest their heads. Although a queen or king-sized bed seems like an excellent way for your guests to feel at home, twin beds offer more versatility. With twin beds you can have fun with sheeting. You don’t have to use the same colour or shade for the comforters and pillows as long as they match the room’s arrangement, which can give you more options with decor. You’ll also have more accommodation for the amount of people you can house. Guests have the option to have their own sleep space to stretch out, or couples can push the beds together should they need to snuggle. Mirrors can really open up a room because they add depth and dimension. You don’t have to go overboard, but a full-length wall-mounted mirror and a small bedside one will make your guest room not only look bigger, but it will allow your visitors to conveniently get ready in the comfort of their own suite. A simple bedside lamp will ensure that your guests won’t have to get up to turn off the room’s main light. Most homes are wired for ceiling lights, but a bedside lamp – especially one with an energy efficient soft light bulb – will create a soothing glow for your guests to read by before they hit the sack. A box of tissues in a decorative case that matches the room’s colour scheme is an inexpensive way to create coziness. Woman’s Day recommends a softer brand since your guests are less likely to go through an entire box during their visit. You can even choose tissues that are scented to give the room a nice aroma. If your guest room isn’t carpeted, a small throw rug placed beside the bed – or beds if you go with the twin option – can add a touch of colour and gives your guests somewhere to step when they get out of bed in the morning to avoid the cold floor. You don’t need to invest a ton of money redoing your spare room, but small changes can create an inviting and stylish guest room that will have your friends excited about their next visit.